ABODIA is a design resource with a focus on interiors, art, architecture and travel. We interview artists and designers, as well as share decorating tips and travel advice. A little while back, Sarah and I started compiling pictures of the rooms of our 'Dream Homes'. We started with bathrooms. Our Dream Homes are the perfect homes we're hoping we'll manifest into existence one day (mostly through excessive vision boarding!) They inspire us to think ahead, and to make what small design improvements we can to the homes we already have. Sharing our plans for them here gives you a glimpse of our personal style, and gives us a chance to compare notes on our likes & dislikes. So, from bathrooms, we move onto living rooms. As we began scrolling through Pinterest looking for our favourites, we considered the evolution of this dual-function space, and the design challenges that sometimes come with it. In 1961 Parisian architect Augustin-Charles d’Aviler published Cours d’architecture ('Lessons in Architecture') and identified the difference between formal rooms for display, designed purely for receiving and impressing guests, and rooms in which home-owners could relax and really “live” in - the latter being a relatively new concept at the time! An additional room designed for everyday life, separate from a grand space intended for showing off status and wealth, soon became a popular idea. 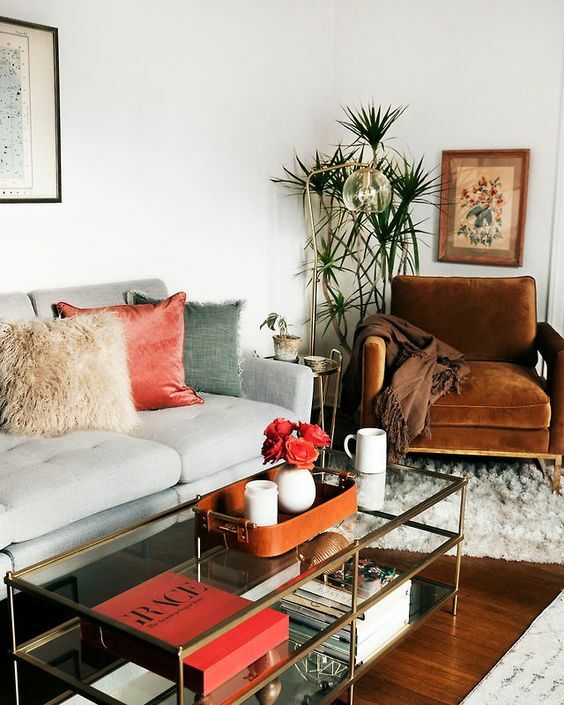 By the 20th century the term “living room” was commonly used and now usually refers to a room where there is either a fine balance or a real struggle between formal space for entertaining in, and a comfortable space in which to splay out and watch Netflix. Sometimes, it the very room designated for everyday living, no matter how well designed, is the room we do very little living in at all. I wonder if technology has anything to do with this. Others will say the kitchen is the real "heart" of the home, where we naturally gather and linger. Nevertheless, living rooms are generally designed to be the nucleus of a household - the room where the identity of a home is established. It is here that an assemblage of objects that speak most to who we are, tend to have pride of place. Whether it is frequently used or not, the living room is intended as a social centre, and unlike the kitchen where there is often a myriad of activity, the living room is the place where we may simply sit and enjoy the company of others. In both of our dream homes, the living room is filled with beautiful objects that tell our story - who we are, where we’ve been, and what makes us happy; it is an inviting, comfortable place that makes us feel at ease and makes others feel welcome, providing a place for both quiet solace and shared laughter among friends. As a mother of twin toddlers, Sarah actually dreams of having two living rooms (one of them for the toy baskets and upholstery that is chocolate-finger friendly!)... Wise. 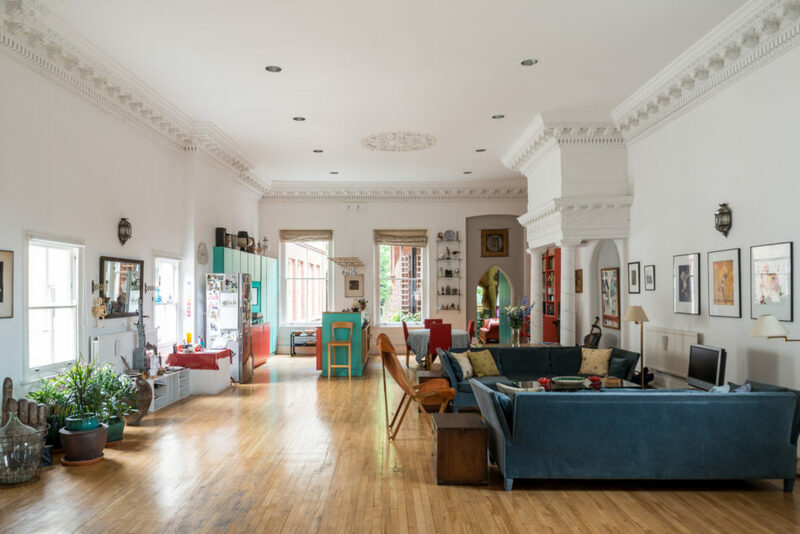 Here are the lovely living rooms of our dream homes (for the grown ups) ;) We've jotted down a few words on why we’re vision-boarding them. Universe, are you reading?! A converted chapel and ballroom, no less! I am a sucker for open plan spaces, and I love this large white space with its green kitchen and blue velvet sofas. I would probably add a few more lamps around the 'lounge' part to make sure it was cosy enough in the evening, but during the daytime there is so much gorgeous light. I also love a plant in the living room... if I can keep it alive! According to Elle Decor, this is 'cozy modernism' and I think this is why I like it (and nothing to do with Amanda Seyfried). I like the combination of the simple white lamp with all the different textures and darker colors going on. I like the throw on the sofa for a bit of cheeky tartan-esque stain protection! I think this room looks so stylish. I love the combination of materials wooden and metal beams, with marble table top, velvet sofas and glass! The shelves need some books to fill it our of course... But look at that gorgeous chandelier... and that fireplace! 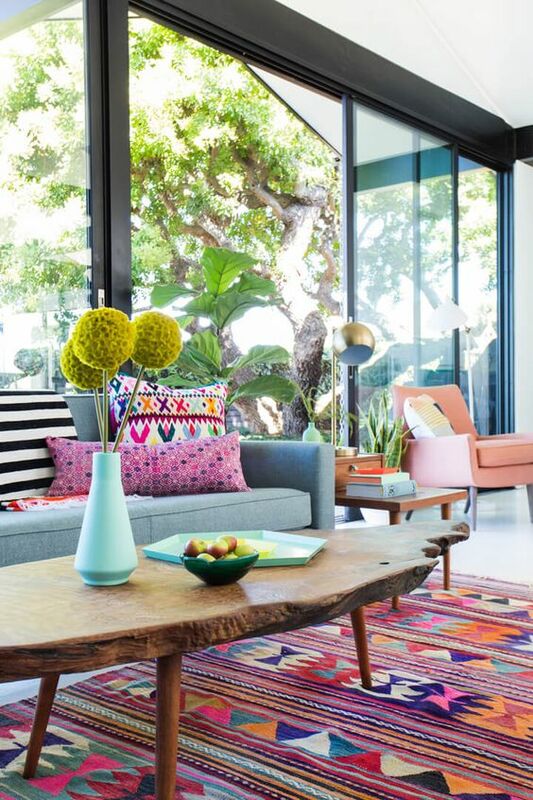 This room combines a few things that I love: sunlight, colour, and more sunlight. For such a big space with very high ceilings and very white walls, the bright colours, art and lush fabrics make it appear soft and inviting. I also love that there are different seating areas, the giant painting is fun, and I think that grey sofa looks comfy! Once again, I am drawn to a room that is spacious and sunny. I have to say, I am not a huge fan of the sofa choice, though the fabric looks comfortable. I'd have chosen something deeper and longer, to stretch out on. Other than that, this room is "balanced" to me... There are symmetrical shapes, and asymmetrical shapes, and colours pop up in just the right places.. (the blue triangles in the carpet pick up the blue of the vase in the window; the pink cushion reflects the pink circle in the painting; the yellow on the carpet picks up the yellow triangles on the sofa cushion... etc!!) I like that there's a dining table and a mini-bar for entertaining. And lastly, I imagine that at night, with the lights dimmed, this room, as spacious as it is, would feel cosy. I've chosen this room because I like the size of it - it's not as vast and roomy as my other two choices. I also love the dark wall colour and the way the gallery wall pops out against it - it creates a dramatic edge in a room that's not too fussy. I think the seating looks comfortable - I could lie down on that sofa. And of course, there is still lots of lovely sunshine! Everyday Cambodia, In A Bookh. Dec 30 Everyday Cambodia, In A Bookh. Keep up with ABODIA posts!